Below is a compilation of videos of the event caught on police dashcams (©North Port Police Department) and security cams. Below are the maps of the witnesses location with the first estimated trajectory. 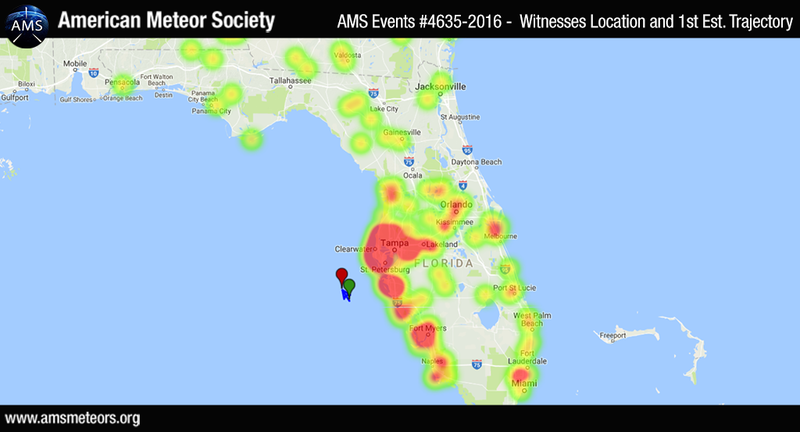 The preliminary estimated trajectory plotted from the witness reports shows the meteor was traveling from the Southeast to the Northwest and ended its flight on the sea East of Anna Maria Island. We were driving south on 75 at that time, between Sumterville & Wildwood on the way to Tampa. All of a sudden not more than 20 feet in front of me, i saw a bright light….at 1st thought of fireworks, then saw the center which was as large as a watermelon & the glowing gas around it….I came to a dead halt, thought it was going to hit us….it landed on the side of the road near a lightpole…..no time to get the phone camera on. It was the most spectacular thing I have ever seen !!! We were exhausted from the long drive, but this woke us up. My son said Mom what if it had landed on the car ? Well we might not have been here to report it lol. I’d have been tempted to wait for it to cool down and then grab it. Meteorites are worth an enormous amount of money to researchers and collectors. But that brings up a question. How long does it take for such a fireball to cool down? David, if any remnants made it to the ground they would be cool to the touch as they basically free fall through the cold lower portions of the atmosphere before reaching the ground. Our family was sitting outside around 8:00pm on November 23rd and two people spotted a meteor racing from east to west glowing red and blue with a fiery tail. I was driving home and heading up the midpoint bridge in Cape Coral and seen what I thought was an unusually bright and close falling shooting star and just as I reached the top of the bridge the bright light exploded and instanteiusly lit up the sky in every direction as far as I could see. It was one of the most amazing things I’ve ever seen. I feel like i was extremely lucky to have what I felt was the perfect vantage point to view this meteor. In my opinion it was headed straight down on SW Cape Coral. Our news channel reported it the next day as a meteor the size of a grape. I’ve heard other reports it was the size of a car. All I can say Is whatever it was it was big and if it had hit the ground it would have caused massive damage. 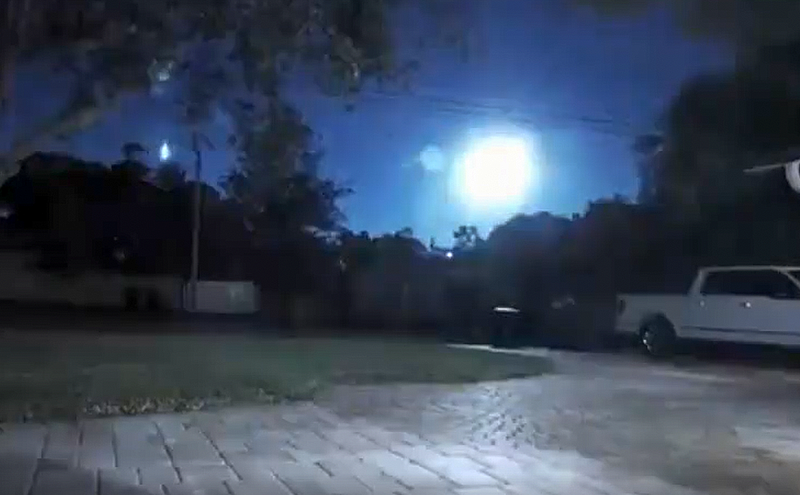 On Monday November 21 I was ready to go to bed when I saw this enormous fireball coming from the sky it seemed like it was hitting the water of Fort Myers beach Florida. Something that large I have never seen before. I live in Atlanta and have seen two falling fireballs this week. The first my boyfriend saw as well. We thought it was a shooting star, except they both fell straight down rather than streak across the sky..I was extremely freaked out when I saw the exact same thing tonight. What is going on up there? I found that a russian spaceship carrying food and supplies disappeared yesterday and fireballs are being seen all around the world. Super strange. I live in Orlando and was out on my usual walk to 7/11. Next thing I know, out of the corner of my eye, I see a streak of light and then I look over to see a meteor going straight down towards what looked like the coast line of Tampa. It made a bright flash and broke up. After it broke up I watched the individual meteorites trail off and burn out. Great night to say the least. Update: it looked to start at 45 degrees elevation and end at 15 degrees. It was a bright blue and white. Brightness magnitude was anywhere between -4 to -2. 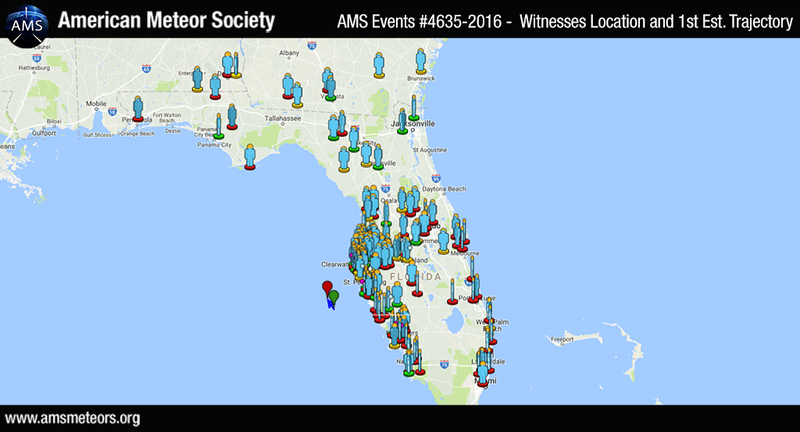 I was walking the dog in North Ft Myers about 11:45 pm on April 25, 2017 when I saw this large, bright white meteor streaking from the southwest direction toward me. It was quite high in the sky. It then turned bright green and started breaking apart with the pieces following one another. As it descended the remaining pieces turned orange like a flame that flared up and then it was gone. Such an amazing sight! Even my dog followed its path.